This blog by Gemma Siemensma, Library Manager at Ballarat Health Services describes the thinking and processes behind the introduction of their DSpace repository, the Ballarat Health Services Digital Repository. Ballarat Health Services (BHS) is the major hospital for western Victoria. Located an hour west of Melbourne it is the principal referral centre for the Grampians region, which extends from Bacchus Marsh to the South Australian border, covering a catchment of 48,000 square kilometres, and providing services to almost 250,000 people. The BHS Library kept hardcopy folders of research publications. There was no access or knowledge of what hospital staff had produced except the occasional mention in an Annual Report. Using an Endnote library was not an option as the organisation doesn’t license it. Piles and piles of “historical stuff” was dumped in the library. People didn’t want to throw out anything of value so they kindly gave it to us. We had no idea what we had and were often asked if we had old photos etc. that were of past staff or old buildings. I liked the idea of a repository as I could chase the copyright for researchers and make the items freely and publicly available. A repository was clearly in line with my organisation’s values as it would allow staff to be recognised as researchers and enhance the research reputation of the organisation. It didn’t take me long to realise that I needed to go down the repository path. I had explored the functionality of our existing catalogue but it wouldn’t suffice. I spoke with several vendors to hear about their products and had a bit of a play with these online. For me (and my miniscule budget) the costs were extremely prohibitive. I also spoke to repository staff at universities to garner their ideas and opinions (thanks to staff at the University of Ballarat and Swinburne University of Technology whom I pestered on several occasions). I put a call out to the aliaHEALTH e-list to see what other hospitals were doing. There were few responses however one did mention that they were heading in the same direction and were looking at using DSpace which could be hosted externally by Prosentient Systems based in Sydney. Hospital IT Departments can be restrictive and Prosentient could provide the support and training I would require. I also read lots and lots about different repositories and played around with them to see if they would suit our needs. We decided to use DSpace for a variety of reasons. It was a lot cheaper than other systems and Peninsula Health were also looking to head down this path so we figured we could work in tandem. DSpace (through Prosentient Systems) would come configured and hosted and they would look after the technical side. These are skills that no one is our library (EFT of 3.2) possessed at a high end level. This included helping us set up an IT sub-domain; configuring the site; Handle registration; Google analytic set up; indexing on Trove; training; and helping to test, re-test and tweak the system. It also included on-going support and maintenance which we pay for annually. We had worked with Prosentient before (they look after Gratisnet ILL system for health libraries) so we were confident in their abilities to help us. DSpace was also very popular with universities so for me it had credibility and lots of support out there which I could tap into when required. Research – this contains published journal articles, books, book chapters, conference papers and theses. We chase copyright from publishers for all completed works. We are yet to chase authors for pre-publication versions as we are still getting a feel for how this all works. This is something we hope to do more of in 2014. We currently sit at about 20% of full text research but expect this to rise. Historical content – so far this includes Annual Reports from BHS. These have been scanned and indexed in Trove. In the future we aim to add in newspapers articles, photographs, internal reports and recordings. Before beginning the repository it was put to both the BHS & St John of God Human Research and Ethics Committee (HREC) and the BHS Research Advisory Committee to garner support. Both were keen to see the repository implemented as it highlighted what research was undertaken within BHS and the region. The repository was also added to organisation wide policies. This included the “Rules for Publication/Presentation” policy as well as embedding it in HREC documentation. Each year BHS hold a Research Symposium and I am asked to speak about where we are up to and encourage people to deposit works into the repository. I also promote the repository in the internal staff newsletter. There is also the possibility for external promotion in the local newspaper in relation to the historical documents. The historical components also open up opportunities to work with local historical groups, the research room at the local public library and other local archives. The BHS Digital Repository has just ticked over its first birthday. In that time we have managed to add just over 400 items. Three-quarters of these relate to research and we have many more to add. The researchers we worked closely with in the initial stages of the project are very keen to alert us to new publications and we are finding that when we approach staff about publications they are happy to give us a list of all their work for inclusion. Over the last three years, the majority of health libraries have remained static or experienced a decrease in their budget, staff hours and space. As a manager I know that I need the library to add value to the organisation for them to recognise that we are a resource worth keeping. I feel that implementing a repository has done this. Not only has it shown us that we have transferable skills, but it has opened up professional visibility for both the organisation and the library. We communicate more widely across the organisation and in doing so are promoting the library and showing staff that we are more than just books. When we talk to researchers it puts the library in their head space and they approach us more frequently for help. It’s a win-win situation. Australia has a good track record in relation to open access, from hosting one of the first country-wide thesis repositories in the world to supporting the development and management of institutional repositories. While initially much of this work was pioneered by the university libraries, the Australian Government has made significant commitments more recently. This blog post gives a short rundown of some of the open access initiatives Australia has seen since 2000, starting with the most recent developments – open access mandates from the two main funding bodies. In 2012 the National Health and Medical Research Council (NHMRC) announced its revised policy on the dissemination of research findings, effective 1 July 2012. 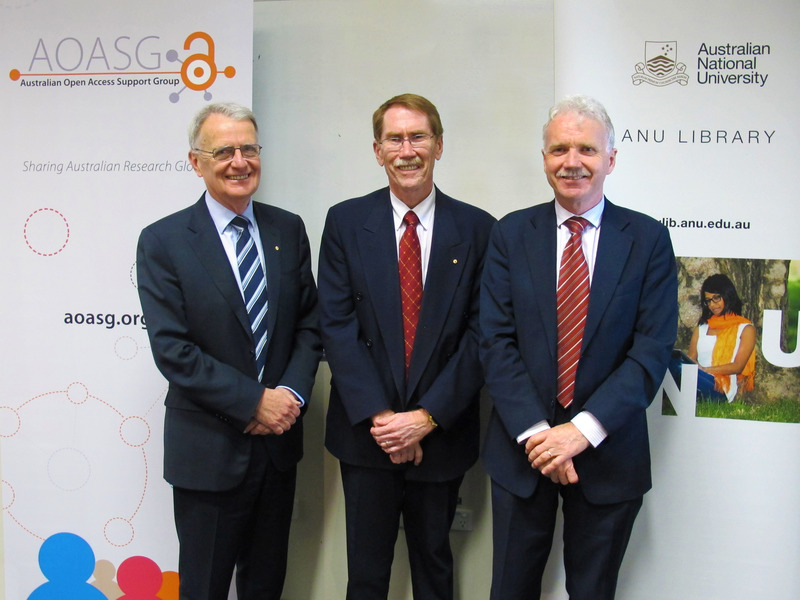 The Australian Research Council (ARC) released its Open Access Policy on 1 January 2013. Both policies require that any publications arising from a funded research project must be deposited into an open access institutional repository within a 12 month period from the date of publication. There are two minor differences between the two policies. The NHMRC relates only to journal articles where the ARC encompasses all publication outputs. In addition, the NHMRC mandate affects all publications as of 1 July 2012, but the ARC will only affect the outputs produced from the research funded in 2013. Researchers are also encouraged to make accompanying datasets available open access. Both the NHMRC and ARC mandates specifically require deposit of metadata (and ideally full text of the work) into the researchers’ institutional repository. This position takes advantage of the existing infrastructure already in place in Australian institutions. All universities in Australia host a repository, many of them developed with funds the government provided through the Australian Scheme for Higher Education Repositories (ASHER). This scheme which ran from 2007-2009 was originally intended to assist the reporting requirement for the Research Quality Framework (RQF) research assessment exercise, which became Excellence in Research for Australia (ERA). The ASHER program had the aim of “enhancing access to research through the use of digital repositories”. Australian repositories run on software platforms ranging from EPrints, DSpace, ARROW (a VTLS commercial front end to Fedora), to ProQuest Digital Commons (bepress). A full list of repository software platforms for Australian universities is here. Repositories in Australia are generally managed by libraries and have been supported by an ongoing organised community. In 2009-2010, the Council of Australian University Librarians (CAUL) established the CAUL Australian Institutional Repository Support Service (CAIRSS) and when central government funding for the service ended, the university libraries agreed to continue the service by supporting it with member contributions. CAIRSS ended in December 2012, however the email list continues a strong community of practice. In October 2012 the Australian Open Access Support Group launched, commencing staffed operations in January 2013. The group aims to provide advice and information to all practitioners in the area of open access. Historically Australia has a strong track record in providing access to research. The Australasian Digital Theses (ADT) program began in 2000 as a system of sharing PhD theses over the internet. The ADT was a central registry and open access display of theses, which were held in self-contained repositories at each university using a shared software platform that had been developed for the purpose. The first theses were made available in July 2000. In 2011, as all theses were then being held in universities’ institutional repositories, the ADT was decommissioned. It was estimated that the number of full text Australian theses available in repositories at the time was over 30,000. The Australian Government has made a significant commitment to the development of a successful digital economy underpinned by an open government approach, aimed at providing better access to government held information and also to the outputs of government funded research. The Australian National Data Service (ANDS) is federally funded to the tune of tens of millions of dollars. It has responsibility for supporting public access to as much publicly funded research data as can be provided within the constraints of privacy, copyright, and technology. In an attempt to provide a platform for sharing information about data, ANDS has developed a discovery service for data resulting from Australian research, called Research Data Australia, which is a national data registry service meshing searchable web pages that describe Australian research data collections supplementing published research. Records in Research Data Australia link to the host institution, which may (or not) have a direct link to the data. The work of ANDS reflects the broader government position in Australia of making public data publicly available. The Declaration of Open Government was announced on July 16, 2010. This policy position is in the process of practical implementation across the country, providing access to information about locations of government services, for example. The level of engagement between government areas and different levels of government varies. Another government initiative has been the Australian Governments Open Access and Licensing Framework (AusGOAL) which has an emphasis on open formats and open access to publicly funded information and provides a framework to facilitate open data from government agencies. In addition to providing information and fora for discussion, it has developed a licence suite that includes the Australian Creative Commons Version 3.0 licences. Other publicly funded institutions in Australia also share their research through repositories. The Commonwealth Science and Industry Research Organisation (CSIRO) has a Research Publications Repository. In addition, some government departments are making their research available, such as the Australian Institute of Family Studies and the Australian Institute of Health and Welfare.